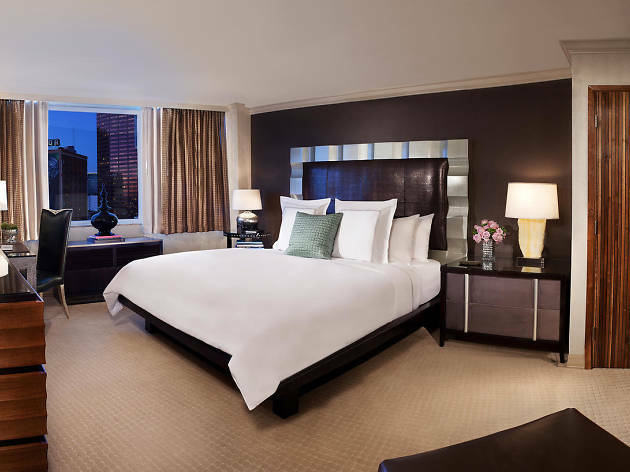 A boon for conventioneers, concert-goers and tourists looking for clean and chic accommodations, the 178-room Luxe City Center hotel pairs large-scale reliability with warm service and modern details for a hip DTLA experience that doesn’t skimp on comfort. The Luxe City Center bills itself as an urban oasis, and for a hotel that sits between a concert hall, a sports arena and a freeway, it’s also surprisingly amenable to travelers hoping to add some R&R between the museums and the Lakers game. Guestrooms boast comfy perks like down pillows, flat screen TVs, and rain-style shower heads; particularly weary travelers can blow off steam in one of the hotel’s two fitness centers (the Luxe City Center offers an on-site exercise suite, as well as complimentary passes to Gold’s Gym down the block) or book an in-room massage from the front desk. The hotel’s restaurant, Nixo Patio Lounge, provides striking city views and an impressive list of specialty hamburgers, and if you’re looking for specialty dishes, you’re only steps away from one of L.A.’s most diverse neighborhoods. The banking district is a haven for late-night haunts, from classy cocktail bars to concerts at the nearby Nokia Theatre; the Luxe City Center is a solid choice for visitors looking to partake in what might be the city’s best neighborhood for nightlife. Location: The Luxe is situated smack in the middle of L.A.’s rapidly evolving Downtown business district; the hotel is close to blockbuster attractions like the L.A. Live entertainment complex and the Staples Center, as well as boutiques, galleries and a slew of upscale dining options, all in an incredibly walkable urban setting. The Last Bookstore: This former bank building is now a highly Instagrammable vault of literature that features a cornucopia of reasonably priced reading material as well as records, coffee and a packed events calendar. Philippe the Original: The best French Dip sandwich in downtown L.A. is a hotly contested honor; tender meat, salty broth, and prices that honor the stand’s 1908 opening date place us firmly on Team Philippe. Grand Central Market: This historic food hall offers an international smorgasbord of eats in a casual setting. Linger over fresh oysters and a glass of bubbly at The Oyster Gourmet, then stop by G&B for an espresso and a salted caramel donut. Fleming’s Prime Steakhouse: Thick cuts and a full wine list make this airy chophouse a posh dinner option. For the same glitzy atmosphere at a lower price point, Fleming’s offers happy hour deals on drinks and appetizers from 5-7pm nightly. L.A. Live: With a concert venue, a movie theater and a smattering of bars and restaurants, you’d be remiss to stay at L.A. Live’s namesake Marriott and not pay the entertainment complex a visit. 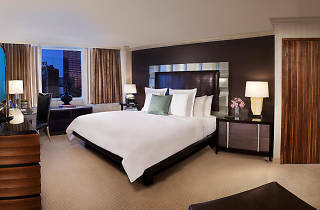 Good for: Sports fans, concert attendees and conventioneers can take advantage of the hotel’s prime location between events, while tourists—particularly those who are young, young-at-heart, or otherwise into nightlife—will appreciate the Luxe City Center Hotel’s spacious rooms and comfy accommodations as much as they will its proximity to the best of DTLA. If you're looking for a place to stay in DTLA, I highly recommend staying here. Not only is this location perfect right across the street from Staples Center, but the prices are better than some of its neighbors and the rooms are spacious, clean and comfortable. I had one of the best night sleeps there, despite the rooms being a little noisy.